Overview: This Batch Photo Printing feature will allow you to select as many photos as you like (hundreds) and batch print them 2 to a page, 4 to a page, 6 to a page, any number you wish per page. Just click a few buttons and walk away and let the software and your printer do the work. Note: You may select as many photos to print as you wish, even thousands. 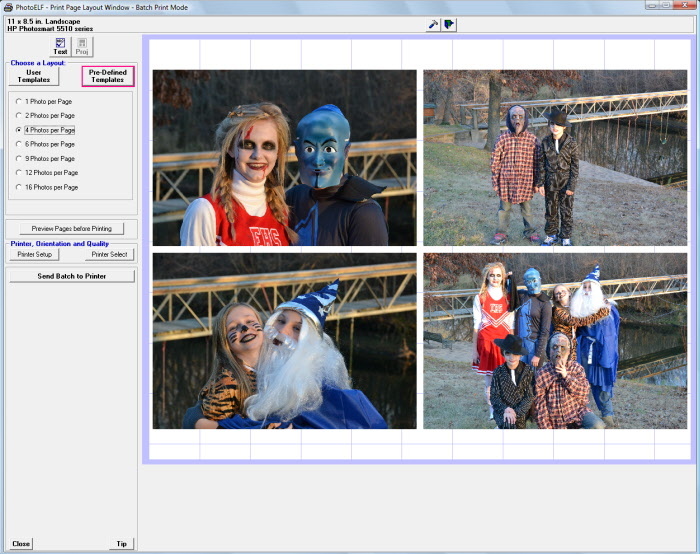 Once the Batch Photo Printing window appears, you may select a template. Either a User Defined template or Pre-Defined template. When you select a photo , you will be presented with an example of what that layout looks like. If you like the layout, click the Begin Batch Printing button or select a different layout. This prompt will remind you to check your printer settings, (quality, paper size, paper type etc.). Make sure the printer is set up correctly before the batch print job begins. This prompt will also show you how many sheets of paper to load in your printer. If you wish to print two or more copies of each page, increase the number of copies and the required sheets number will automatically be updated. Once you click the Start Batch Print button, the print job will begin. PhotoELF will then load photos, per the template layout, and send each page to the printer, automatically, until all photos and pages have been sent to the printer. Once the batch print job begins, there is not a good way to stop it, so make sure you have your printer set up correctly first. Your printer, (not PhotoELF), will consume almost all of your computer's resources during this process. Begin the job and walk away. You may wish to abort the print job if you immediately detect that the printer settings are incorrect, such as: paper type, paper size, print quality etc..
For your first time using this feature, do a small print job to become familiar with this feature.